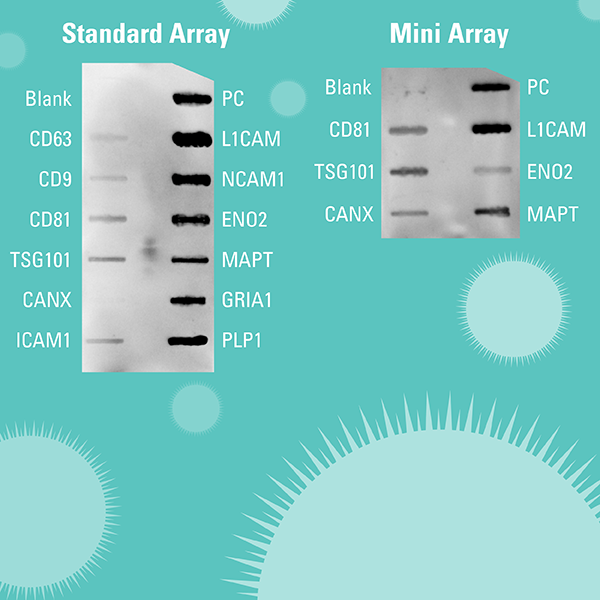 Streamline detection of exosomes derived from neurons with Exo-Check™ Exosome Antibody Neuro Arrays. Whether you’re interested in biomarker discovery, studying normal neural processes, or unraveling the biological basis for neurological diseases, exosomes shed by neural cells can provide critical data and key insights. To help researchers quickly and efficiently identify exosomes carrying neuronal markers, SBI now offers the Exo-Check Exosome Antibody Array (Neuro), an extension of our popular and effective Exo-Check Array technology that enables antibody-based detection of many targets in parallel with the convenience and simplicity of a membrane-based dot-blot. Sample Exo-Check Antibody Array (Neuro) data showing exosome detection and confirmation of the presence of neuronal markers. (A) EVs were isolated from 250 µl of pooled human serum using SBI’s ExoQuick Reagent, and 10 µg of EV-associated protein were loaded onto a standard Exo-Check Neuro Array. (B) EVs were isolated from 250 µl of a different pooled human serum sample and 50 µg of EV-associated protein were loaded onto a mini Exo-Check Neuro Array. The Exo-Check Neuro Array is sensitive, providing robust and reproducible signal from as a little as 10 µg of input sample. EVs were isolated from 250 µl of human serum using ExoQuick Reagent ,and either 10 µg, 20 µg, or 50 µg of EV-associated protein were loaded onto a standard array.